Summer is almost here. I can feel it. Every time we get a warmer day the women of NYC are giddy with sandal wearing and summertime accessories. The flowers are blooming, the farmer’s markets have returned and the season of grilling is almost upon us. That is until I started making my own sauce. I have had some great bottled BBQ sauce, and I know some people swear by their go-to brand. But for me, making it from scratch makes all the difference between good chicken, and chicken people can’t stop talking about. 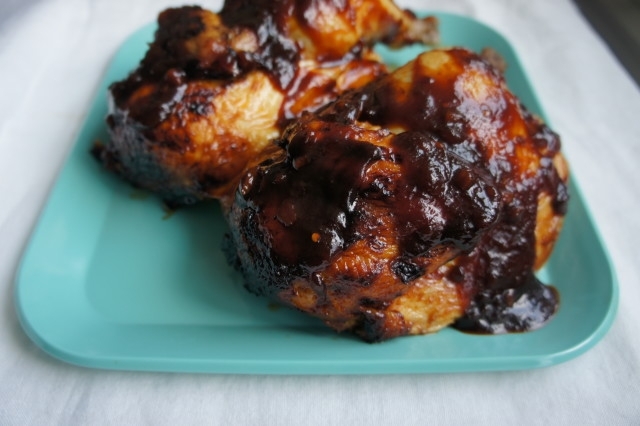 This spicy honey BBQ sauce is really quick to whip up and is inspired by this recipe from Taste of Home, one of my go-to places for tried-and-true home cooked dishes. I kept the coffee in, which really adds just a subtle flavor and balances out the sweetness of the honey and ketchup well. This chicken is perfect for Shabbat and also for a summer BBQ. I promise, your guests will not stop talking about it. Note: if you don’t have an upright chicken roaster I recommend investing in one like this. They are really cheap (less than $10) and make such a difference making a super moist chicken with crispy skin. In a medium bowl mix together orange juice, olive oil, garlic cloves, salt and pepper. Place chicken in a large, ziploc bag and pour marinade over chicken. Allow to marinate for at least one hour in the fridge or up to 3 hours. In a medium saucepan, saute onions until soft and translucent. Add garlic and cook for 2 minutes. Stir in ketchup, vinegar, honey, soy sauce and coffee. Bring to a boil and then reduce heat to low-medium. Simmer for 35-45 minutes stirring occasionally. Preheat the oven to 400 degrees. Roast chicken upright using an upright roaster for 50-60 minutes or until meat thermometer reads 160 degrees when inserted. 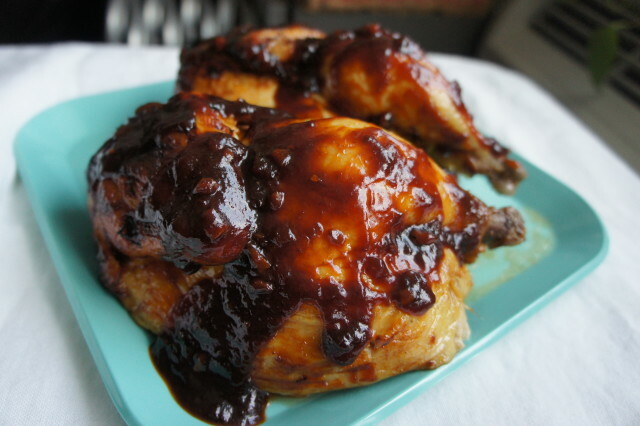 About halfway through roasting, brush some of the BBQ sauce all over the chicken and place back into the oven until cooking time is complete. Allow the chicken to rest long enough to cut into quarters. Drizzle additional BBQ sauce on top and serve.